If you are thinking of exploring Yogyakarta with particular Yogyakarta tour package, it is a good idea to consider booking your tour package during the Grebeg Besar Ceremony. Similar to Grebeg Mulud and Grebeg Syawal, Grebeg Besar is a popular custom ceremony that is held annually. It can be a great alternative if you have missed the celebration of Grebeg Syawal and Grebeg Mulud. Grebeg Besar is conducted by Sultan Palace of Yogyakarta to mark the Eid al-Adha. This ceremony is usually held right after the Eid prayer in the morning. Not every Yogyakarta tour package will make you able to witness this ceremony especially because it is only held on the day of Eid al-Adha. This ceremony is also held by Kasunanan Surakarta. 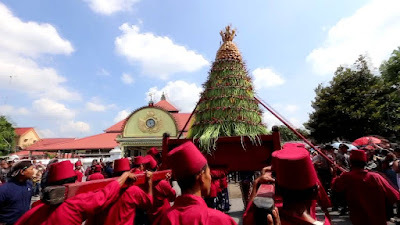 The grebeg ritual in Yogyakarta is started with the release of Yogyakarta court accompaniment force which consists of Nyutro, Wirobrojo, Bugis, Patangpuluh, Daeng and Ketanggung. They will wear uniforms with bold color and attributes while bringing traditional weapons such as dagger, spears and rifles. It’s certainly something you cannot find on the daily Yogyakarta tour package. One of the things that become the highlight of any Grebeg Ceremony in Yogyakarta is the Gunungan. Gunungan is a range of agricultural products which are arranged to form a big cone that looks like a mountain (Gunung). The Gunungan is then used for “rayahan” event where people who participate on the ceremony can take the product on the Gunungan. The Grebeg Besar ceremony typically takes only 3 hours from 9am to noon. It means that you will have a lot of time available to continue your trip on exploring Yogyakarta. You can get a Yogyakarta tour package that is fun to be done during noon to evening. Here are some ideas for the fun things you can do after watching Grebeg Besar ceremony. If you love to witness the moment when the sun set on the sky creating that beautiful color, you can consider going to Ratu Boko Temple. This temple is a popular and favorite site to watch sunset in Yogyakarta. You can book a Yogyakarta tour package to watch sunset in Ratu Boko after you finish watching Grebeg Besar ceremony. Ratu Boko and Prambanan Temple is close to each other. After watching the magnificent sunset in Ratu Boko, you can continue your journey to Prambanan Temple and watch art performance that is usually held in the temple complex. One of the favorite Yogyakarta tour package in Prambanan Temple is to spectate the exclusive Ramayanan Ballet. Now the question is where we can get the best tour package to watch Grebeg Besar and to do other things in Yogyakarta to its finest. Don’t worry since there is www.jogjabromotour.com which is always there to help you get the most fun tour package. So, don’t hesitate anymore and book your next Yogyakarta tour package only on www.jogjabromotour.com.